A set of notable dates has helped to wake up these lazy hot days of summer, 2016 - if you're a film enthusiast, that is. 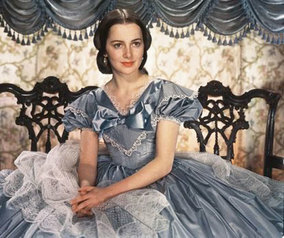 June 30 marked the 80th anniversary for the publication of antebellum author Margaret Mitchell's Pulitzer prize-winning novel, Gone with the Wind, and July 1 saw the 100th birthday of one of the film's last surviving stars, Olivia de Havilland. 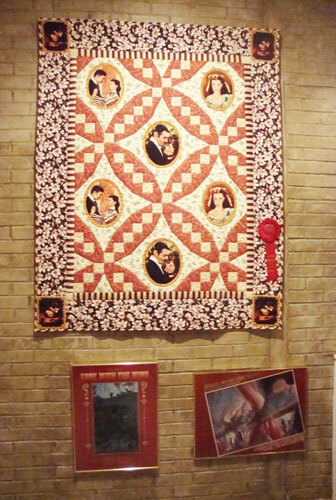 If you're like me, these dates are not marked on your calendar, but oddly enough, GWTW and the world of movie memorabilia collecting managed to find me - in of all places - Jefferson, Texas. This notable small town is inundated with a steady stream of tourists who love haunted hotels, an unsolved murder of one Diamond Bessie, swamps, antiques, Texas history and all things Gone with the Wind. Inspired by an episode of a popular PBS travel show called The Daytripper, I went road tripping to see Jefferson for myself. On my last day there, I managed to snap a few photos and buy a couple of Hattie McDaniels souvenirs before hurrying out of town. Looking over the pictures a few days later, I was amazed at how many items were lovingly displayed in this cozy site. 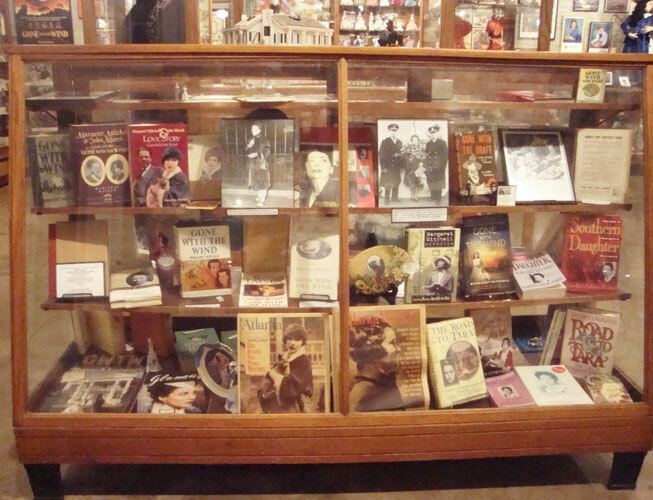 Literally hundreds of GWTW collectibles, posters, lobby cards, Christmas tree, books and a Scarlett - Rhett costume display beckoned the eager eyes of the average GWTW fan, film lover and collector. Frankly, my dears, it was all so overwhelming. 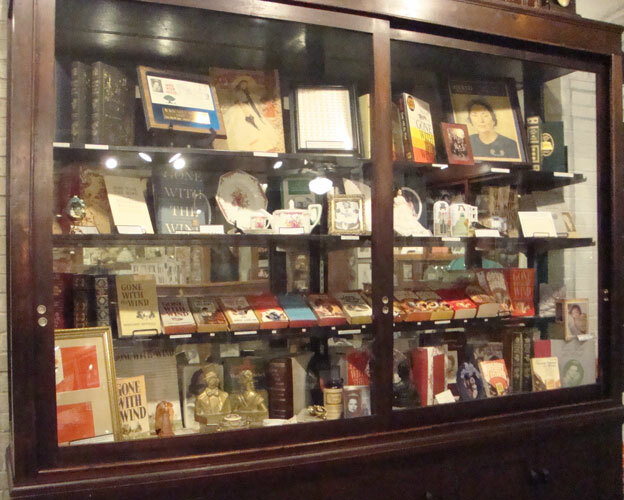 If anything, the museum highlights the vintage collector's motto of "there's always room" - for one more collectible, period artifact or handcrafted piece. The collector understands the millenial mantra about the journey being more important that the destination, because whether it's collecting Depression-era glass, miniature shoes, political campaign buttons or rare comic books, these adventurers can recount how they obtained every treasure with great relish and misty eyes. And the movie memorabilia collector is no different. I remember sitting in a small warehouse, with the outside temperature hovering at 100 degrees, pouring over a towering stack of lobby cards and old autographed movie stills, occasionally wiping the sweat from my glasses, just to look at 'a few more' images. The collector spends many a happy day, hunting in shows and festivals, networking on collector's online forums, and scanning EBay/Etsy pages, always on the never-ending quest for yet another beloved trinket. Add to this the unending supply of collectible gifts from family and friends, who proudly recount how they came into their own latest find, just in time for that birthday or holiday gift. The story is always the same, whether the collector houses 20 objects or in the case of Bobbie Hardy, an entire museum. 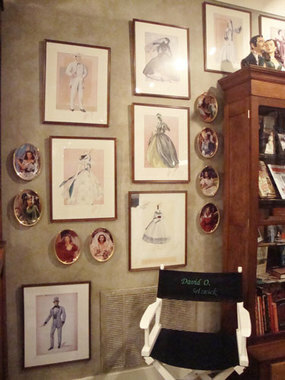 This intrepid soul began collecting GWTW memorabilia in April, 1980, some 36 years ago. She was first initiated into the GWTW collecting world through Herb Bridges, "the foremost collector on GWTW" in 1980 at a "Breakfast with Herb Bridges". 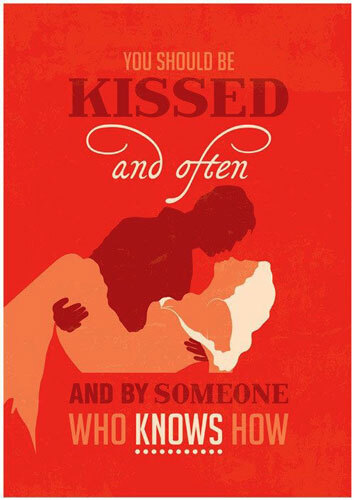 His vast knowledge and enthusiasm so inspired her, " I came away with a whole new life." 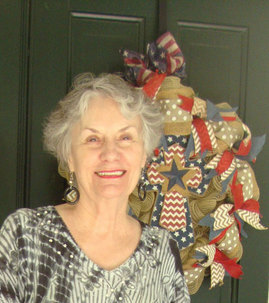 Bobbie Hardy's chance encounter with Bridges sparked a 36 year passion, culminating in the development of her Scarlett O'Hardy's GWTW Museum 18 years ago. Bobbie first read the novel and experienced the movie while in high school. "From the very beginning, my focus has been Margaret Mitchell and her book, which continues to inspire me." The novel's lasting popularity comes as no surprise to her, "It's never been out of print, and it's second only to the Bible in popularity, so it must have some sort of merit." 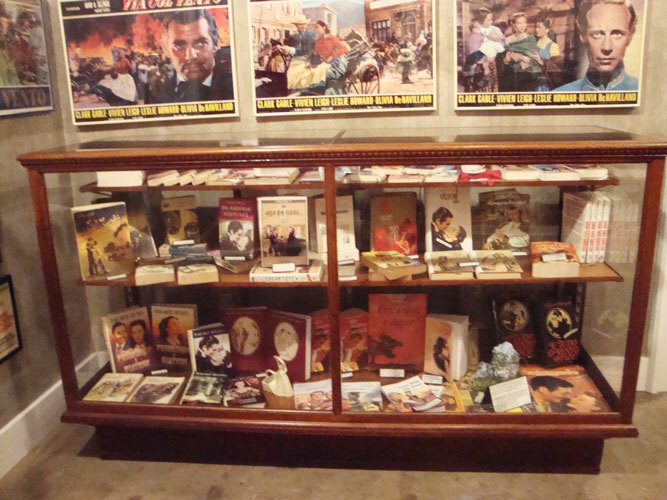 She received her collectibles from friends, GWTW shows and by networking with other collectors. Her favorite piece is a doll house replica of Twelve Oaks mansion's exterior and Tara's interior, created by David and Linda Hass, from LaGrange, TX. She received it as a gift for her 60th birthday. 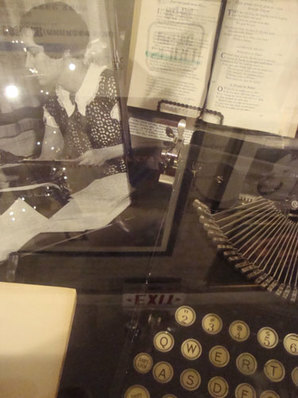 A signed first edition of Margaret Mitchell's novel, gotten from Kenneth Nicks, sits in a display case, next to a Remington typewriter, similar to the original (housed in the Atlanta-Fulton Public Library). 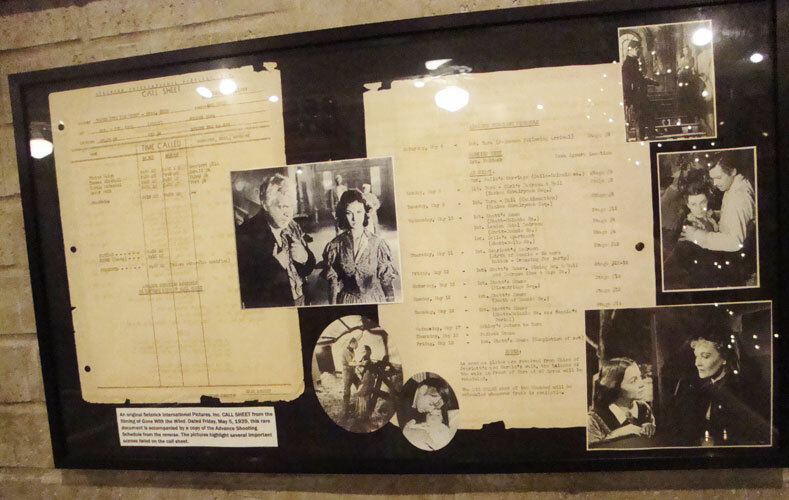 Bobbie's close friend, JoAnn Elliott Bond, designed and decorated the GWTW-themed tree, "she had the patience of Job", and it's central location in the front lobby celebrates their shared love for this classic film. 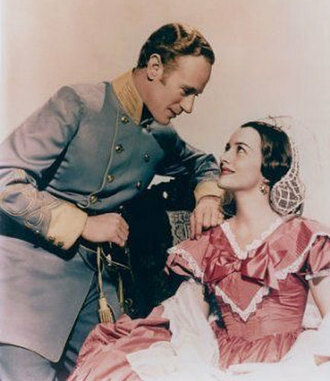 When asked who her favorite character was from the film, Bobbie said it was Mammy, "because she is the strongest force in the motion picture". "She's very protective, and abides by her way of doing things, after all - what kind of person would Scarlett be without Mammy's influence? 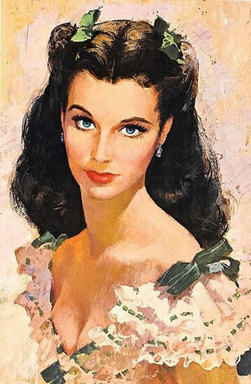 She was always concerned about Scarlett's reputation and helped to save the O'Hara's. Mammy understood that some of Scarlett's decisions had to be done - like marrying Frank Kennedy to save Tara. She deserved her Oscar - she earned it." These collectors are the unsung historians, who can reel off a dizzying lists of facts and trivia about their particular film niche. 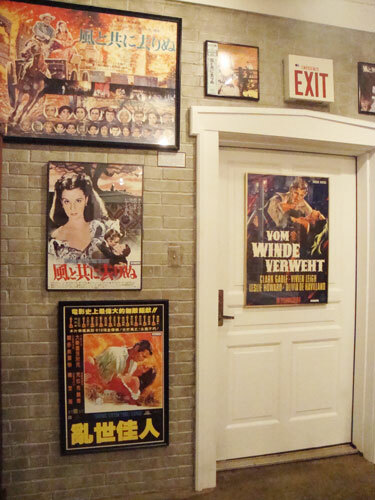 Whether it be GWTW, noir, or the silent era, these urban scholars all share a common trait - their intense devotion to research and study in the field of film memorabilia. 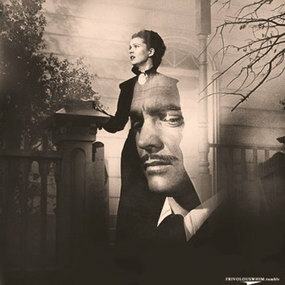 The GWTW film was created within a cauldron of controversy for its racial stereotypes and romanticized portrayal of history, yet this 1939 film continues to fascinate both sides of the American cultural divide. There are so many articles that still examine the historical and ethnic arguments surrounding this cinematic phenomena, that I hesitate to wade into deep waters here. Let me just say that when I read Ms. Mitchell's novel as a teenager, I was struck by several things: her command of the English language, her celebration of a fatally flawed heroine, and her love-hate relationship with her central black heroine, Mammy. 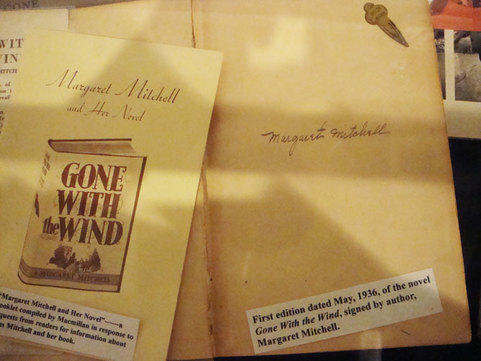 Margaret Mitchell could tell a story that captivated even this cynical northerner, simply by her forceful talent to transport the reader into the southern milieu of the civil war period. Through her perspective, I was able to understand a collective mindset that was radically different from my limited experience and beliefs. 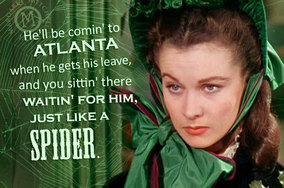 At the time I read GWTW, there were a few faded examples of female empowerment in popular culture. It was the early 1960s and the women characters in film and television were shown as married and at home. The 'second wave' feminist movement was just beginning and sweeping changes had yet to make it to the streets. 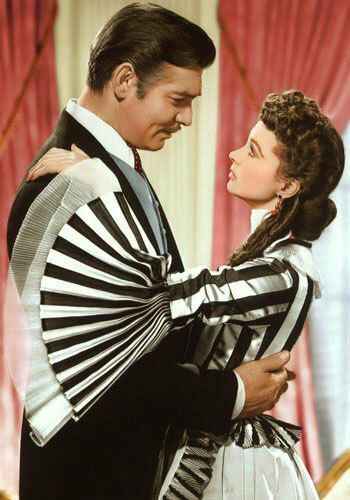 But GWTW was within my reach. 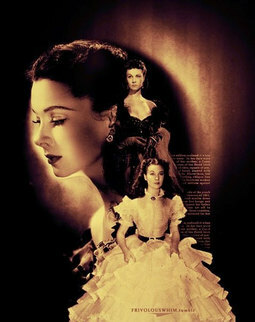 Scarlett O'Hara was a mixed set of contradictions! 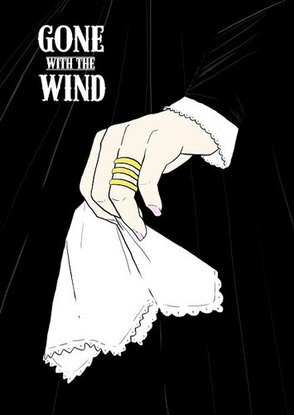 She was married, yet ruthlessly running a business. Scarlett thought nothing about slapping Prissy, but gave her father's gold watch to Poke, even though they desperately needed money to save Tara (as detailed in Susan Myrick's "Black Myths and White Columns". And her ego-driven antics drove Rhett - and just about everyone else - to the point of distraction. Mitchell was smart enough to create a strong protagonist cloaked in a wide array of shabby emotions to counter the fact that she enjoyed real power for a woman. I may have been young, but even I could see where Mitchell's sympathies came home - to Mammy. 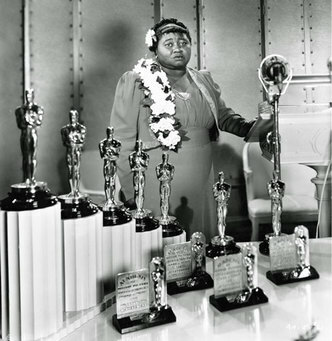 In forming an independent spirit within a stereotype, Hattie McDaniel's Mammy was the fulcrum of the story - strong, opinionated and definitely no one's slave. 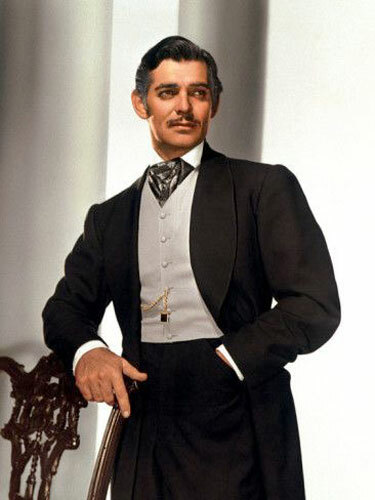 McDaniel's took a lot of heat for the role, but every character in GWTW serves as a multi-faceted dialogue on race, ethnicity and gender that should not be looked at through a one-dimensional lens. 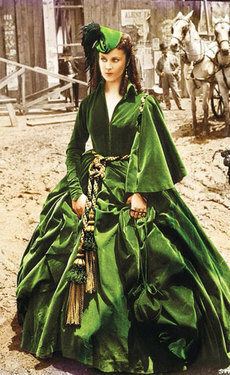 GWTW can be seen annually on TCM and this year - after a 40+ year hiatus - I watched it again. It's easy to see why it's still so very popular, as age hasn't dimmed this stunning Hollywood production, made during the golden age of American film. And yes, the stereotypes and discrimination can't be edited out, but nor should they be. 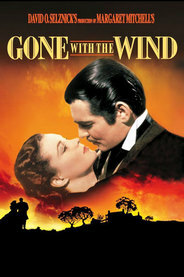 Like the Holocaust, GWTW acts as a sharp reminder that no matter how well written or produced, the codified system of racism eventually becomes just dust in the wind. 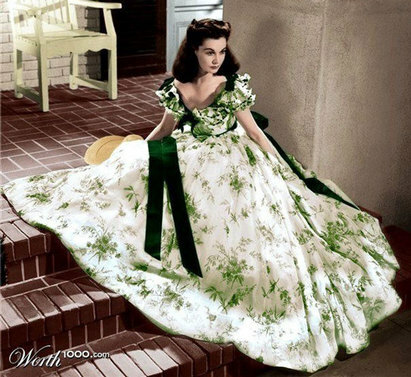 Rosemary McKittrick, "Herb Bridges Collection of GWTW Items Goes for $334,588". http://www.liveauctiontalk.com/free_article_detail.php?article_id=365 . July 10, 2016. Michelle E. Shaw, "Herb Bridges, 83: ‘GWTW’ Collector Enjoyed the Chase" http://www.ajc.com/news/news/local-obituaries/herb-bridges-83-gwtw-collector-enjoyed-the-chase/nZ8JX/ . September 26, 2013. July 10, 2016. Annette Witherridge, "I'd Rather Make $700 a Week" http://www.dailymail.co.uk/news/article-3462821/I-d-make-700-week-playing-maid-working-one-Hattie-McDaniel-black-Oscar-winner-Mammy-Gone-Wind-segregated-Clark-Gable-white-actors-Academy-Awards-ceremony.html . February 25, 2016. July 12, 2016.
http://www.findadeath.com/forum/showthread.php?10036-Hattie-McDaniel&s=147c06ac64ecc3514d5dc60a68206ddd . July 12, 2016. ​Susan Myrick, "Black Myths and White Columns"